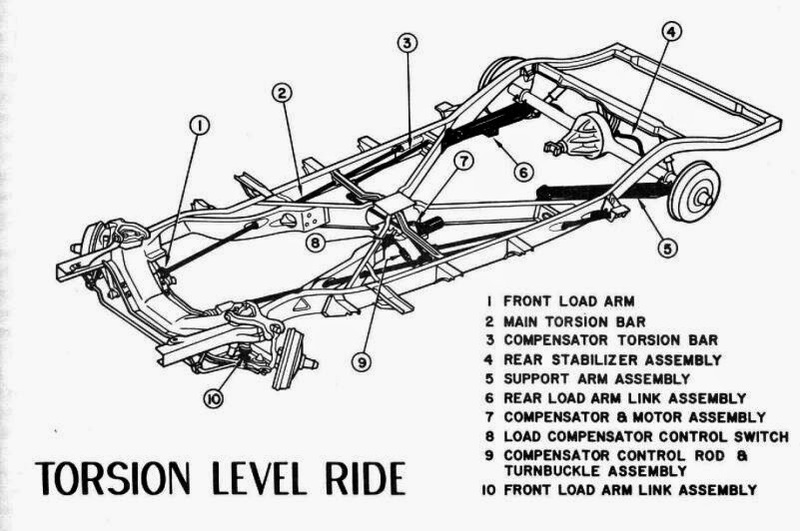 Basically, the entire car "floats" on four points, the front & rear opposite twist lever arms of two long (106" in Juniors, 111" in Seniors) torsion bars, one on each side. The major advantage of this arrangement is that any reaction at the wheel, such as hitting a bump or pothole, is transmitted to the opposite wheel (front or rear) and NOT the frame, greatly reducing twisting stress on the frame. Another positive effect to wheel reaction is that the opposite (front or rear) wheel reacts in the opposite direction, tending to keep the car dynamically level, in other words, very little pitch is experienced, if the shocks are in good condition. Two additional short (46" in Juniors, 51" in Seniors) torsion bars connect the rear suspension with a levelizer mechanism. This electro-mechanical system, after a 7-10 second delay, applies more or less twist to the short torsion bars which lift or lower the rear. This keeps the car statically level, compensating for loaded weight such as additional passengers and/or luggage in the trunk. Here's a video of the torsion rod leveling system in action (with the Packard in a garage sitting on a lift). You can hear the motor run and see the body adjust to level when weight is added / removed from the rear of the car. this is what is called, a truck stop!